I took this picture of the hammerhead on the North point of Little Brother in the Red Sea, Egypt. 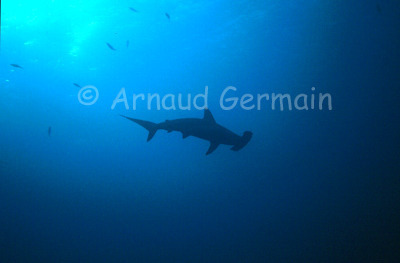 I was down at 30 metres, trying to keep my position against the current and the hammerhead was swimming above me. I used my Motormarine II camera with a Fuji Sensia 100 film and turned off the flash to create a silhouette effect. Hammerhead sharks are incredibly shy and the slightest disturbance sends them away.